I have mentioned before how a big accident can affect a driver adversely (my article, Reflections on Mortality), so it was good to see Robert Kubica in top form all weekend and showing no ill effects from his horrific crash in Canada. If either of the BMW drivers was suffering physically, it was Nick Heidfeld, still not fully recovered from back problems encountered during testing. That may explain why Nick was not quite as fast as Kubica this time out, whereas he has generally had the upper hand this season. And, if that is correct, it shows that the car is getting very close to Ferrari/McLaren performance. Had Nick been fully fit, would he have been able to qualify higher up the grid and take the fight to Hamilton? As it was, Heidfeld had a tremendous race, his battle with Alonso proving one of the highlights, and his fifth place was well deserved. In the off season I had my doubts about Nick but he has won me over with his dogged determination, speed and realism. The potential that was always apparent in Nick is now bearing fruit in a team that keeps its eye on the ball and develops steadily and without fuss. 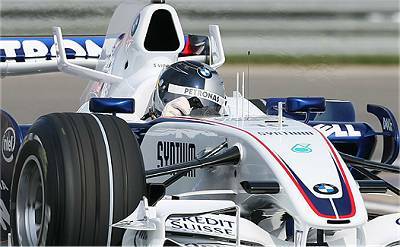 The latest rumor is that BMW will compete in 2008 with the same drivers and this makes perfect sense. Kubica is contracted until 2009 and it would be madness to replace Heidfeld while he is in such excellent form. The Pole had a quiet race, occupying that gap between Hamilton and the Heidfeld/Alonso/Fisichella battle. Kubica was briefly in front of Hamilton after a McLaren pit stop but the Brit was able to muscle his way past before the lap ended. BMW have consolidated their third spot in the constructor's championship and it seems that Renault's hopes of catching them were a bit over-optimistic. Fisichella did his best and raced well but it was never enough to match the German team. Mario Theissen may not be shouting from the rooftops but it seems to me that BMW are very close to achieving their goal of attaining the speed of the front runners. They look quite capable of continuing their rate of improvement and could be challenging for podium finishes before the end of the season.